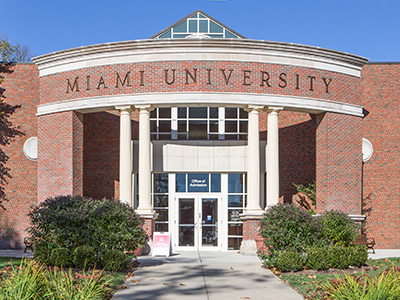 The Miami University Box Office accepts Visa, MasterCard, American Express, and Discover credit cards. *To use a MUlaa account for ticket purchases at a performance venue, students must provide their Banner ID number. Card swipe functions are not available at performance venues. **With proper authorization. Banner Index code and account code must be provided. There are no additional fees for walk up ticket purchases at the Miami University Box Office or at performance venue Box Offices. The Box Office charges a $3.00 per-order service charge on all phone, mail, and fax orders. Family (Parents) Weekend orders have a $5.00 service charge. All online, phone, fax, and mail orders received less than 7 days prior to a performance will be held for pickup at Will Call, which opens at the performance venue Box Office one hour prior to curtain time. Will Call is the place in each venue where you pick up tickets that have been ordered and paid for in advance. Will Call pickup is located at the Box Office at each performance venue. Tickets may be exchanged for other Performing Arts Series regular season events, subject to availability, up to closing time at the Miami University Box Office in the Shriver Center on the business day closest to the performance (Day-of for weekday shows, Friday for weekend shows). Ticket exchange requests at performance venue Box Offices will be handled at the management’s discretion. Tickets from a performance that has already taken place may not be exchanged. Patrons exchanging tickets for events with a higher ticket price must pay the difference between the fee paid for the original ticket and the new event. Any difference remaining from tickets exchanged for events with a lower ticket price will not be refunded. Lost/misplaced tickets may be reissued. Contact the Box Office at 513-529-3200 to have duplicate tickets waiting for you at Will Call. Duplicate tickets cannot be mailed. Due to the nature of performing arts, changes may occur in artists, programs, and performance times. In almost all cases, ticket sales are final. An exception to this would be if an event is canceled outright.